We’ve all been there… Another meeting on our calendar… Another seeming waste of time. Meetings. Meetings about meetings. We all have so many meetings to talk about our work that often it doesn’t leave us enough time to actually do our work. Here are some tips for leading your next meeting… Keep in mind these apply to everyone, including you! 1. Start and end on time. Being late implies that your time is more important. Value the time of others and the ripple effect one late meeting can have on and entire day’s schedule. 2. Keep it consistent and hold people responsible. Create a process and stick with it. Use the same form for your agendas, create some consistent themes or practices. For example, have a round-robin in the beginning of every meeting where each attendees states their most pressing issue or project. Or have employees bring an article of interest and give a 30 second summary. While it may take a while for everyone to get in the habit of new procedures, if you are consistent and people know you’re serious it will catch on. There is nothing worse than a lack of consistency. It makes people unsure as to when and if your next idea will actually stick. 3. Delineate action items. Take it a step further by assigning responsible parties and create deadlines. 4. Send follow up notes. And within 24 hours. Summarize the meeting and action steps so everyone is on the same page and you create a record of your team’s progress. 5. No smart devices. Put the smart phones and Ipads away (except for taking notes). If you’re meeting in person, make sure people are connecting in person. Otherwise it could have been done via email or phone and probably in a shorter amount of time. 6. Be patient. We tend to be uncomfortable with silence and fill the room with rambling in order to fill that silence. Give people time to warm up, think, and respond. 7. Leverage brainpower. Use meeting time to not only report out but leverage the brainpower in the room for discussing and brainstorming about strategic objectives. 8. Do you really need to meet? Think about whether you can accomplish the goal in another way (email? phone? quick chat?) or how you can leverage one meeting for multiple goals in order to maximize time. 9. Be the scribe. 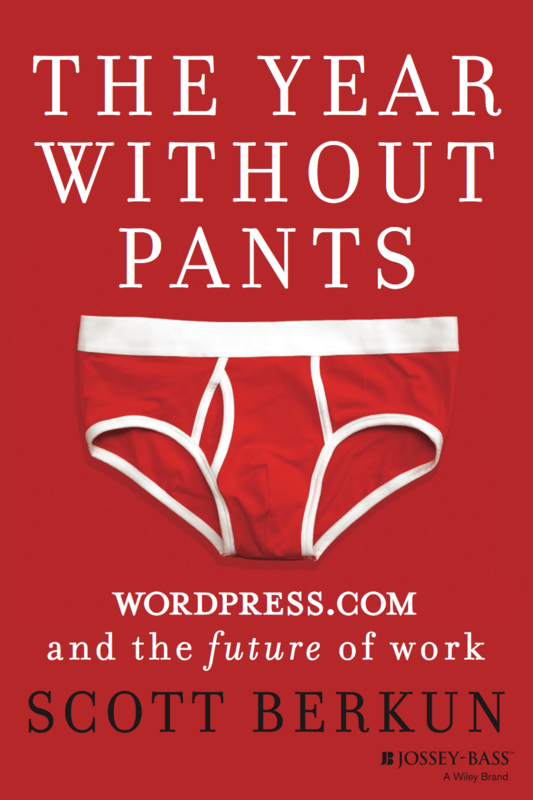 In Year Without Pants, the author suggests that while this is often seen as a chore, it can help establish your credibility as a leader and inspire the trust of your team. According to Berkun, your team will see how you think and if/how you summarize things accurately, clearly and concisely. 10. Share ownership. Make others feel engaged in the meeting by letting them own a piece of the agenda. In a world of meeting after meeting, Alumni Career Services has started “White Paper Wednesdays” in order to focus on the future as opposed to the here and now. Once a month (the first Wednesday) we block our calendars – there are no meetings and less emphasis on email responses. We do strategy work the entire day – those projects that are often the most important but we put on the back burner because we are too busy responding to fires. Similarly, Sarah will post later this month about the book she is reading called Quiet which mentions one company’s policy of “No Talk Tuesdays” where individual work could be done with a thoughtful approach. For our chatty team, we haven’t quite gotten to these yet! We want to know: what do you think makes an effective meeting? What are you biggest meeting pet peeves? Make sure you check out our upcoming webinar “The Art of Meeting Facilitation” on Tuesday, November 12th! Register here. WordPress.com calls their customer support team “Happiness” and it’s employees “Happiness engineers.” The author admits that he began working for the company he was suspicious: can you change the reality of an onerous job and often overlooked team by changing a name? All employees begin their tenure at WordPress with a few day stint in customer support (i.e. Happiness Team). It puts employees on the front line, responding to customers, and learning the intricacies of their company. The Happiness Team analyzed not only the types of problems coming in to them, but data around ticket numbers, response time and the experience of the customer when they submitted a ticket. They strategically changed the process by which customers submit issues so that it sets a tone of responsiveness as opposed to interrogation. They ask each customer, “What did you do?” “What did you see?” and “What did you expect?” in order to gather the most information. This thoughtful approach to the process and content of customer service, beyond just providing “good” customer service in terms of response time and problem solving, was very interesting. They also analyze the success of new employees in the support role as data showed that it was an indicator of future performance. The performance dashboard of each support team employee can be seen by all others, instilling a sense of healthy competition, importance, and accountability. “Every year new trends in work become popular in spite of their futility for most organizations that try them. These trends are often touted as revolutions and frequently are identified with a high-profile company of the day. Concepts like casual Fridays, brainstorming sessions, Lean, Six Sigma, Agile, matrixed organizations, or event 20% time (Google’s policy of supporting pet projects) are management ideas that become popular in huge waves, heralded as silver bullets for workplaces. The promise of a trend is grand, but the result never is. Rarely do the consultants championing, and profiting from, these ideas disclose how superficial the results will be unless their places in a culture healthy enough to support them” (p. 29). Read: We all can’t recreate the Google headquarters, nor should we. It’s easier to utilize the latest trend in company culture than to honestly examine and attempt to change company culture. In the case of WordPress, it was founded based on the principle of open source programming to “democratize publishing.” As a growing start up, this tended to attract like-minded individuals with shared values. Their philosophy eventually distilled down to Transparency, Meritocracy, and Longevity. “Talent is hard to find, especially at new organizations, which allows leaders to justify rushing to hire people who are selfish, arrogant, or combative” (p. 36). Hiring for immediate needs creates problems in the future. Even their employment offer letters are non-traditional examples of the culture, values, and ideals of the company. They come across as more of an inspirational mantra or manifesto than an offer of employment. These are just a few tidbits… stay tuned for more blog posts as I read on. I haven’t even covered HOW employees at WordPress do their work yet (only 1% of their work is via email)! Questions that have arisen for me as I read have been: How do you change a negative company culture? How do you hire for culture? How do you know which management trends (read: fads) will work for your company/organization? What is the role of team culture vs. company culture?